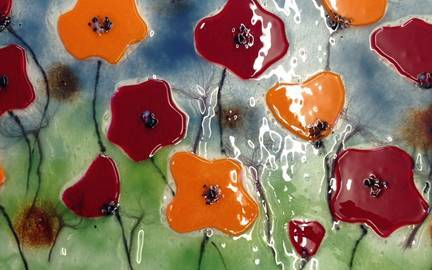 This is a great introduction to the world of glass fusing. This craft has had resurgence in the last 20 years but has been around for 3000 years. 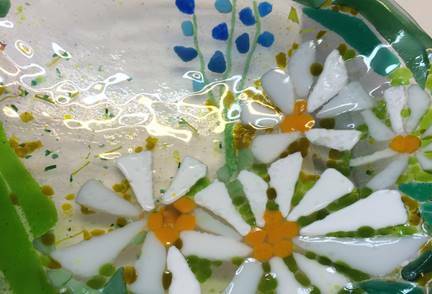 Fused glass plates are usually made by heating two layers of 3mm glass together in the kiln to produce a single piece of strong 6mm glass. We will discuss the properties of glass and compatibility (the chant of the glass fuser!) We will explore the different effects that can be achieved using glass frits, powders and inclusions of metals. You will be taught how to cut sheet glass, how to assemble the glass and how to fire it to create panels or plates. It’s so satisfying to actually make a useful object that you will keep always. We’ll make some coasters and some decorations. You may want to try your hand at a few pendants! Combining sheet glass and frits (grains) and powders you will be able to make some beautiful pieces. I send you home with a basic firing sheet and I hope bags of enthusiasm for a new craft! We can get really creative with fusible glass. In short we will have fun! Your day will start at 10:00am and finish at 4.30pm. 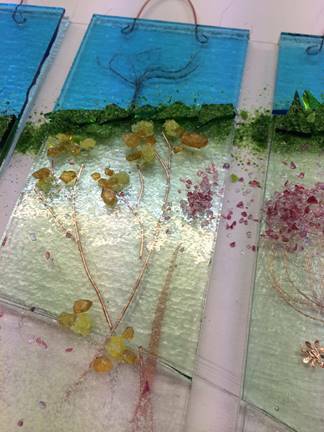 No experience necessary, my fused glass course is suitable for beginners and improvers alike.